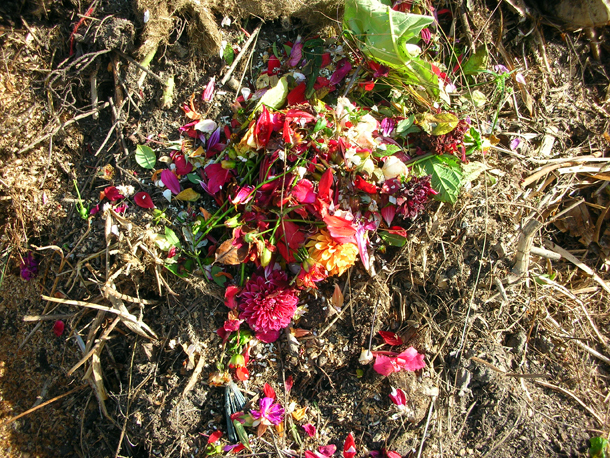 Todays deadheading & clearing of the Exotic Garden nearly filled up a whole bucket, as a weekend has passed since it was last done. I was told the different pot sizes that we used which included 3.5"/ 9cm, 5"/ 12cm and the prices they correspond with. Pots are not needed to be thoroughly cleaned out or sterilised so this enables microorganisms to help plants along. I was shown all the spaces that plants were stored, so that I would know where people meant if they said things like under Leylandia, The Loggia or down the track. 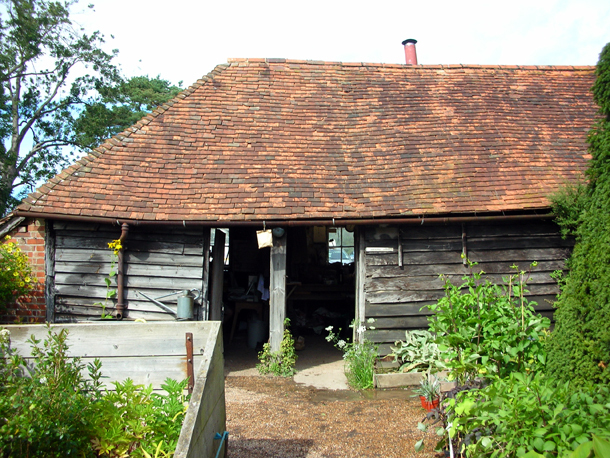 There is a computer room for checking up plants, a potting shed, a tools & soil mixing shed called the The Long Barn, the nursery shop where bulbs are stored. Threes glass houses - one is called Michael's house and the other Kathleen who both work exclusively in the nursery. Michael specialises in seeds & Kathleen in cuttings. The third one is called Begonia house where there is a heated mat & also where tender plants & cuttings are stored - a basic heater is used in winter when it's cold to keep the house at 12 degrees. Winter is tricky for ventilation as it's hard to maintain temperature when it's so cold outside. There is also a lean-to for plants that need a bit more cover. 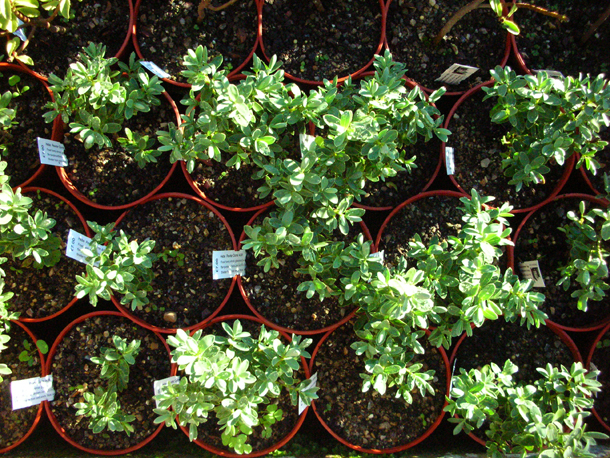 For the best use of space - pots of plants are stored in syncopated lines (like below), and the line always starts from the top down. Labels need to be placed at least in the last pots either end of the line. Labels here are written in capitals - not the correct Latin way, but it helps it be more legible and save the problem of having to decipher any indistinguishable handwriting. On one side plants with long names are split into two lines, on the other side if sowing seeds - the source (e.g. Dixter/ Chilterns) and date below this. 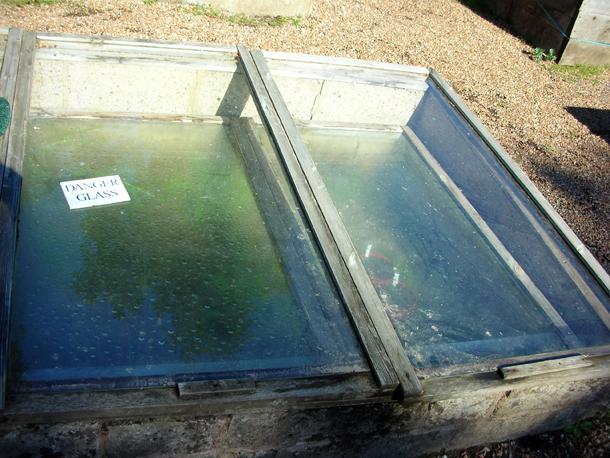 Double glassed cold frames are used for starting off seeds - this helps spread out heat better, at this stage heat is more important than light. But as soon as they have germinated plants must be moved to a cold frame/ greenhouse where they can get the light levels they need and not over stress. The cold frames are shaded if it's too sunny & hessian/ burlap is added as a covering when it too cold. It's like a frame within frame, but the inner one is sunken down a bit so that it is better insulated. Glass frames are heavy, the best way to handle them is to slide them across and if needing to carry them, bending my knees & using crux of belly to support the weight. I was also shown the different mixes of compost - John Innes 1, 2 & 3 are used. An old soil mix from emptied out pots is usually enriched with a bit more fertiliser and used for potting on. More info on how the compost is made, which one is used for what and formulas coming soon! Dixter's formula is good in that it uses less peat than usual mixtures.